Givani Smith scored once in regulation and tallied the lone goal for either team in the shootout to propel the Kitchener Rangers to a 3-2, come-from-behind road win over the London Knights. 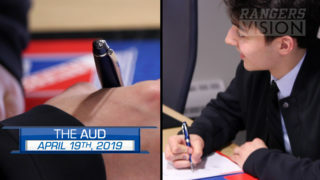 1:30pm – 2:00pm – Adam Mascherin is the special guest on Rangers Off-Ice on The Mike Farwell Show on 570 News, simulcast on Rogers tv. Tune in! 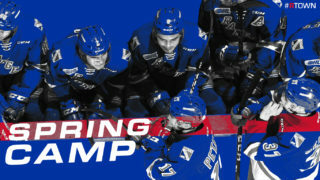 6:00pm – 8:00pm – Members of the Kitchener Rangers will be on hand at The Home Depot at 600 King St. N in Waterloo for a Kids Workshop. Sign up now in person and join the Rangers in building your very own hockey hat rack! 10:30am – 11:30am – Tune in to 107.5 DAVE ROCKS as Connor Bunnaman and Connor Hall join the broadcast and take over the rock-waves for an hour! 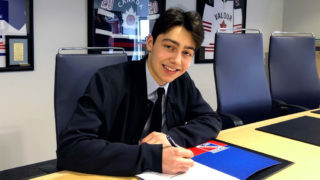 7:00pm – Watch Rangers defenceman Giovanni Vallati take part in the Sherwin-Williams CHL/NHL Top Prospects Game as a member of Team Cherry at the Sleeman Centre in Guelph. The 2018 Sherwin-Williams CHL/NHL Top Prospects Game features 40 of the CHL’s top players eligible for the 2018 NHL Draft. 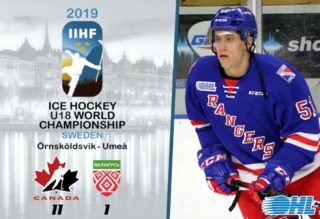 This season marks the 23rd annual showcase with the next wave of NHL talent from the Ontario Hockey League, Quebec Major Junior Hockey League, and Western Hockey League. The game will be broadcast live on Sportsnet (East, Ontario, Pacific, 360), TVA Sports, and in the United States on NHL Network. The game is also available online at http://chllive.ca.